While we live in what is arguably one of the most beautiful places in Canada, Vancouver Island has its share of rainy days. Needless to say, not everyone is blessed with a sunshiny wedding day here in Victoria BC. Which got us thinking, why don’t we see more in-studio wedding day photos these days? Remember the traditional studio-shot wedding portraits of days past? Here on Vancouver island, we know from experience that you can’t always count on the weather to cooperate. Inside Cinderbloc Studio you get a clean, controlled and malleable environment that is perfect for uniquely artistic wedding portraits. The clean bright studio setting offers the versatility to create any atmosphere desired. And so a West Coast Beach theme was chosen, in order to bring a bit of our distinct island style inside. Colour inspiration came from one of this season’s top trends - Pantone’s 2016 Colours of the Year, Serenity & Rose Quartz. This calming pallet kept our setting soft, romantic and comfortable. No need for gumboots and umbrellas here! Antonio LaFauci from The Best Men Wedding Photography brought to the table a purposefully timeless shooting style, steering away from Instagram-esque filters so as to keep the images from looking dated in only a few years time. Amanda and Jeanell from The Lock and Key provided carefully curated pieces that fit our desired setting and colour scheme. 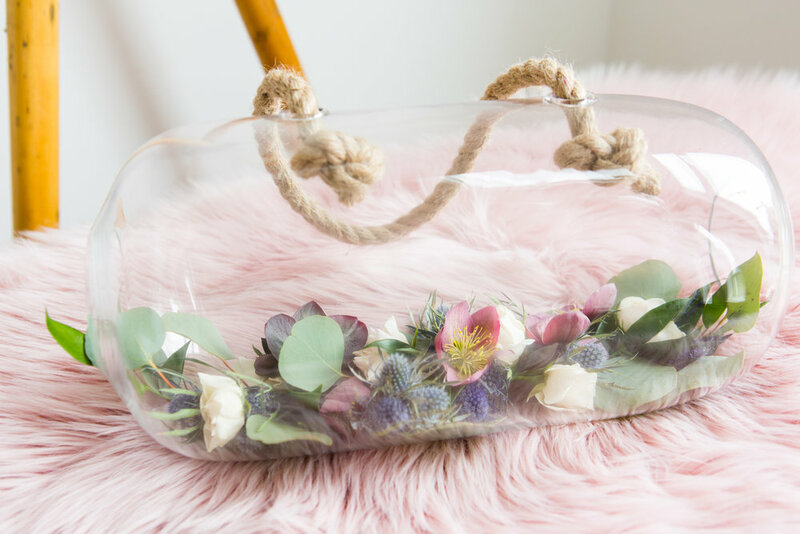 Contrasting textures such as glass and faux fur were incorporated in order to add interest to the space, while organic materials such as driftwood and rope maintained the west coast style. Fresh oysters nestled in a bed of ice sat atop a unique blue side table, offering luminous hues that complimented the set as a whole. A particularly exciting addition was the wicker peacock chair, offering up a unique focal point that we were able to dress with a stunning arrangement from Stigma Florals. Gowns were provided by Shades of White Bridal. The chosen wedding dress worn by Vanessa was by Sottero-Midgley - a tulle fit and flare, ivory tone over lavender mist gown adorned with bold appliqués. This suited our colour scheme perfectly and the sweetheart neckline with delicate seed pearls was in keeping with our ocean theme. Alli’s bridesmaid dress was a lovely blush toned v-neck gown with stylish lace overlay on a fitted bodice and chiffon skirt. Using rose gold, champagne and oyster toned colours, Alexa and Laura from Artistry By Alexa created makeup looks that would photograph well while staying within each girls individual comfort zone. 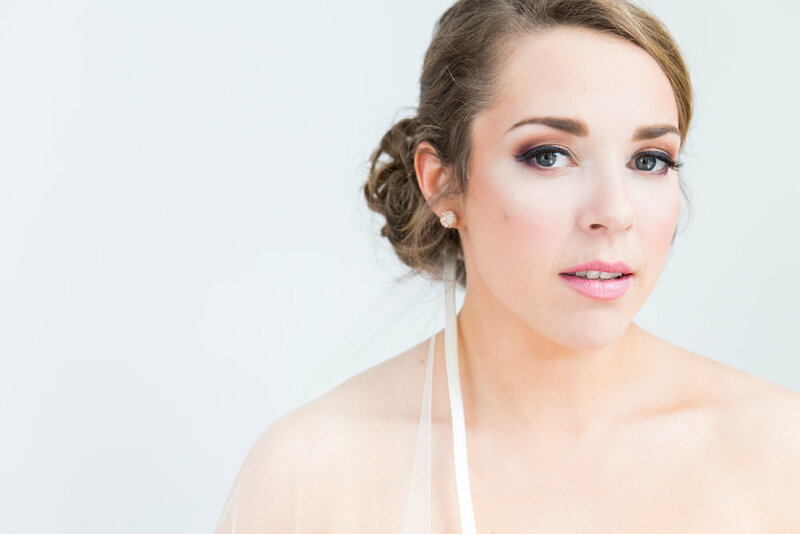 Taking inspiration from many of the individual looks their 2016 bridal makeup clients have requested, they created two makeup looks that fit well within the inspirational perimeters of the shoot, while also speaking to this years bridal makeup trends. Keeping the focus on the eyes was an important element - we wanted to play up their natural eye colours by using contrasting colours like gold and warm plum. Light feeling and photography-friendly airbrush foundation paired with complimentary rose and pink lip tones completed this gorgeous west coast style collaboration. Sofia Pastro* from Life Of Hair styled the girls' hair with fluidity inspired by wearable romance. For the bridal style, Sofia looked to offer versatility in veil placement, as she had both a birdcage and cathedral veil to work with, intended to be worn at different times of the wedding day. The placement of the cathedral veil in particular was key, creatively placed below the up-do in order to show off the the beautifully styled hair rather than cover it in the traditional manner. 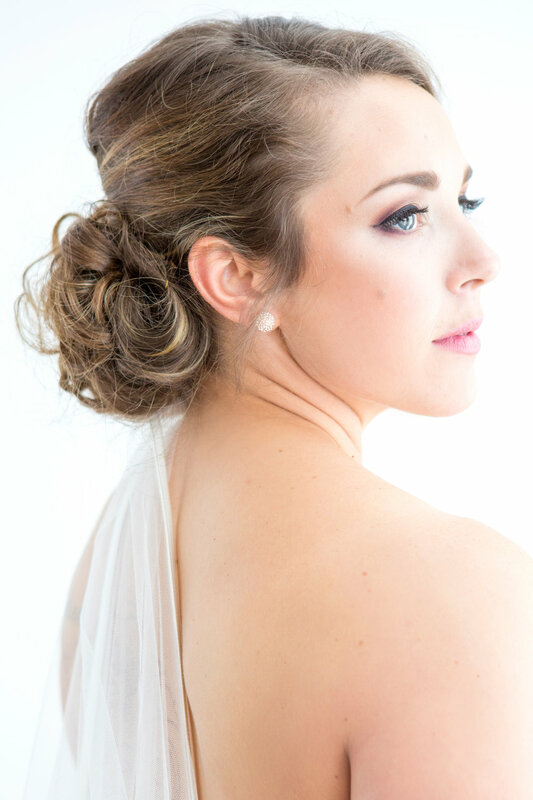 *The Artistry By Alexa team is excited to have Sofia as one of the talented stylists providing bridal hair services to our brides in 2017. Our fearless creative director (and fellow A by A makeup artist) Amy Broere from Squish Creative lead our talented team of vendors to greatness at every turn. A talented graphic designer and visionary of all things brand worthy, Amy is able to see a concept pieced together in her mind before any of us have even begun to sketch our ideas. Amy was truly the person who brought these photos to life, in every sense of the word. Alexa's dreams of showing up to the studio in pajamas were foiled by the presence of our talented videographer, Aaron from Rhymes With Orange photography, who generously offered up his Sunday and videography talents to spend the day with our fabulous vendors. Check out the videos below for the real behind the scenes action! In conclusion - we had a very enjoyable and inspiring day in the studio playing with this seasons new colour and design trends, while really exploring the idea of creating a modern twist on traditional wedding portraits. Not to mention, shooting with Toni from the Best Men is nothing short of a memorable experience - his relaxed and joke-around shooting style made our time at Cinderbloc fly by. Proving that work and play can truly mix - the resulting images are elegant and timeless. The studio setting allowed Antonio to really capture the personalities and relationship of our Bride and her Maid of Honour. We hope to see this trend grow over the next few seasons, as a fun exploration of controlled studio environments with a gentle tip of the hat to the portrait studios of days past.